The minibus driver kindly dropped us off at the end of the road into Mosedale, saving us the two mile road walk. We had a new leader for the day, Ian, as Patience had to go home to sit an exam. It was a warm and sunny day, and the long walk along the bridle path along Mosedale was very pleasant indeed. 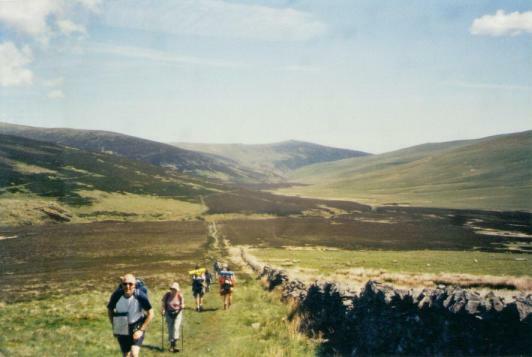 We were again following our old friend the river Caldew as we very gradually ascended towards the head of the valley. This area, known as Back o’ Skiddaw, seemed very remote, and I definitely want to come back and explore it further. Eventually, we reached the very remote Skiddaw House, sited so that it had a perfect view back down Mosedale. Skiddaw House (Lakeland’s highest habitable house, according to my guide book) was originally a shooting lodge, then a bothy, and until recently was a Youth Hostel, but is currently unoccupied. We stopped here for a break, and were surprised to see a few other walkers about. We chatted briefly to two young men carrying heavy rucksacks who were doing the Cumbria Way in the traditional direction. From Skiddaw House, we followed a path that traversed the side of Lonscale Fell in a very steep valley. One of our group had been rather alarmed by their Guide Book’s description of this section as being along a ‘ledge‘. I’d been along the path some years previously and reassured them that the path was very wide and the drop on the downhill side was never too precipitous. Funny how the memory plays tricks on you! The path was much narrower than I’d remembered (I’d thought it was like a 4-wheel drive track all the way), and there was a very steep drop (at the narrowest point of the path, of course!). Still, we all made it without any incident. The views ahead down the valley were very enticing, as more and more of the mountains of the Lake District came into view. We diverted off the Cumbria Way to climb the few hundred feet to the top of Latrigg, where we enjoyed our lunch as we admired the stunning view across Keswick and Derwent Water. We then took the path down to Keswick where, as today was such a relative short and easy walk, we had a 45 minute stop for people to do any shopping or sightseeing they wanted to do. I spent the time in the ‘Dog and Gun’, a favourite pub from when I’d stayed in Keswick the year before. I just had an Orange Juice & Lemonade - I don’t drink alcohol when I’m walking, especially on a hot day like this was, as it seems to bring on a mild from of migraine that I suffer from. Strangely enough, the following day I found out that someone else in the group had the same problem, but they’d also been told by a doctor that citrus drinks could also trigger it. So perhaps I’d better stick to Mineral Water in future! Once a walk has finished and the weather cools a bit in the evening, then I’m fine to drink alcohol again. It’s the combination of heat, exercise and alcohol (even ½ a pint) that does it. Someone once told me it was just dehydration, but I’m sure it’s not as it’s happened even when I’ve drunk a lot of non-alcoholic liquid before having a pint. It also happens when I’m very stressed. Anyway, shopping, sightseeing and whatever finished, we then walked back across the fields to Portinscale. No need for a minibus to pick us up today, as the Cumbria Way went straight past our hotel!